During summers, who doesn’t love to have a sun bath at the beach? If you are one of them, you might have already experienced the pain and discomfort caused by sunburn. It caused due to overexposure to the harsh UV rays of the sun. These rays cause damage to the skin cells and lightly alter the DNA. In response to the damage, our body produces more amounts to melamine to stop further damage, repairs the slightly damaged skin cells and kills of the damaged skin cells. During this defense process, we experience redness, tan, pain and itching. Sunburns are classified into three types. The first and second degree sunburn can be treated at home. But third degree sunburn which includes blisters, chills and fever need immediate medical attention. 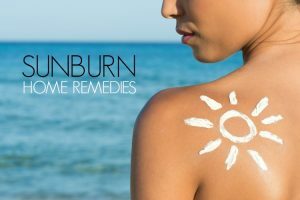 How to Get Rid of Sunburn with Home Remedies? Here is a list of home remedies you can try to treat sunburn without any side effects. You can choose any ingredients as per availability and start treating as soon as possible. Aloe vera contains anti-inflammatory property, 150 trace elements, 99% water, astringent properties and minerals which provide quick relief from the pain and itching caused by sunburn. Slit an aloe vera leaf lengthwise and extract the gel from inside. Apply the gel on the affected areas. Leave it to dry completely and rinse off with cool water. Repeat the application several times in a day to get relief. Note: Make sure to use only freshly extracted aloe vera gel. The starch content and pain relieving properties present in potatoes provide relief from stinging sensation, irritation, itching, inflammation and discoloration caused by sunburn. You can rub a potato slice on the sunburn or follow the below process. Peel and chop a potato in small chunks. Blend them into a smooth paste. If needed, add some cool water. Apply the paste on the affected areas and secure with a gauze if possible. Leave it on to dry completely and rinse off with water. Note: you can apply cold compress on the application for more effective relief. Cucumber contains antioxidant and analgesic properties which are helpful for treating sunburn. As it contains 96% of water, it soothes the skin and repairs the damage. Chop a cucumber into slices and place them on the sunburn area for 30 – 45 minutes and remove them. Alternatively, you can follow the below process. Blend a medium sized cucumber into a smooth paste. Apply the cucumber paste on the sunburned areas. Leave it on for 20 – 25 minutes and rinse off with cool water. Repeat the application few times in a day. For a better consistency and effectiveness, add aloe vera gel or cornstarch. Blend a cucumber and extract juice from it. Place it in refrigerator for 15 minutes. Now, soak a washcloth in it for 2 minutes. Spread it on the sunburned area and leave it on for as long as possible. Repeat the process once or twice in a day to get quick results. ACV acts as astringent which shrink the body tissues to reduce the inflammation. It balances the pH levels which help to speed up the healing process. You can add a cup of apple cider vinegar to your bathwater and soak in it to get relief. Apart from that, you can follow the process mentioned below. Spritz the solution on the sunburnt areas. Repeat the application several times in a day until you get relief from sunburn. Note: As sunburn area is very sensitive, direct application can cause unbearable burning sensation. Also avoid following this process, if you have open wounds and cuts. Water is considered as the best and foremost remedy to achieve immediate relief from the sunburn, itching and skin peeling. Cool water reduces the swelling and pain by pulling the heat away from the burned skin. But make sure to avoid using cold or iced water for this process as it constrict blood vessels which can worsen the problem. Take a cool water bath or follow the below process. Soak a wash cloth in a bowl of cool water. Wring out the excess and apply it directly on the sunburn areas. Let it sit for about few minutes or until it dries completely. Re-soak the cloth and repeat the application again. Follow this process as many times as you can in a day until you get relief. Baking soda is one of the soothing remedies which can provide relief from sunburn and prevent sunburn peeling. It balances the pH levels which help to speed up the healing process and reduce the tanning. Add 1/2 tablespoon of baking soda to your bathwater and soak in it for 15 minutes and bath with cool water. Or else you can follow the process below. Take enough amounts of water for soaking wash cloth. Add few teaspoons of baking soda into it. Mix well until the baking soda completely dissolves. Soak a washcloth into it for few minutes. Wring out the excess and place it on the sunburn area. Leave it to dry completely and wash gently with cool water. Note: You can replace baking soda with cornstarch which also provides the same results. Oats are a rich source of anti-oxidant and anti-inflammatory properties that makes this oatmeal, a perfect home remedy in treating the sunburn from tanning beds. It provides effective relief from itching and shrinking the blisters. Add a cup of ground oatmeal to your bathwater and soak for 15 minutes. Bath normally with cool water and pat dry. Or else you can follow the below process. Blend 1/2 cup of uncooked oats into a fine powder. Combine ground oats, 1/4 cup of milk and 2 – 4 tablespoons of honey. Mix well and apply the paste on the affected areas. Let it sit for 20 – 25 minutes and rinse off with water. Repeat the process regularly to get rid of sunburn. Tea contains tannic acid which pulls out the heat from the affected area and balances the pH levels. It provides relief from irritation and swelling. This process is safe to treat sunburn in pregnant women and toddlers. Though all types of tea are beneficial, green tea and black tea are more effective compared to them. Brew some fresh green/black or any herbal tea. Let it cool down completely until normal temperature. Dip a washcloth in it, wring out the excess and place it on the affected areas. Or else you can dab the solution using a cotton ball. Once the application dries, rinse off with cool water. Repeat the application several times in a day. For extra benefits: add few mint leaves while brewing the tea. Place wet tea bags on the sunburned areas to get relief from the pain, redness, swelling and itching quickly. Add 1 – 2 cups of freshly brewed tea to your bathwater and soak in it for 15 – 20 minutes. Bath normally with cool water and pat dry. Witch hazel is a rich source of tannins and catechins which soothe the inflammation, reduce the swelling, repair the damaged skin and clears off the bacterial infections. Take enough amounts of witch hazel in a bowl. Soak a washcloth in it and wring out the excess. Spread the washcloth on the affected areas. Leave it on to dry completely and wipe the area with a cloth dipped in cool water. Repeat the application few times in a day until the sunburn reduces. Alternative: Using a cotton ball, directly apply witch hazel on the affected areas. Leave it to dry completely and wipe off with damp cloth. This DIY sunburn cream contains effective ingredients that are helpful in treating sunburn. You can prepare and store it for few weeks. It helps to prevent skin peeling, tan, blisters, itching and reduces the redness caused by sunburn. Into a bowl, add 1 teaspoon aloe vera gel, 1 tablespoon witch hazel and 2 tablespoons of water. Mix the ingredients together and keep it aside for 2 – 3 hours. Now, add 3 – 5 tablespoons of baking soda, 1/2 cup of peppermint leaves into the mixture. Stir well and pour it into an airtight container. Leave it aside for 24 hours to get a creamy infuse and store it in a refrigerator. Repeat the application whenever you want. Note: You can add few drops of peppermint oil instead of fresh leaves. Yogurt is rich in probiotics and enzymes that help to give relief from extreme sunburn. It also helps to prevent pigmentation, swelling and skin peeling. It is safe to use on toddlers and pregnant women. Take enough amounts of yogurt in a bowl. Spread a thick layer of the yogurt on the sunburned areas. Let it sit for about 10 – 15 minutes or until the pain subsides. Rinse off the application gently with cool or tepid water. Repeat the process 2 times in a day to get complete relief. Note: Make sure to use only unflavored and unsweetened yogurt for this process. This combination mask provides faster recovery from the pain, swelling, peeling and redness caused by sunburn. Papaya contains many enzymes which have healing capacities. While honey traps the moisture and heals the dry skin. The saponins present in oatmeal soothe the pain and swelling. Peel and mash 1/2 papaya. Combine 1 cup papaya pulp, 2 – 3 tablespoons of oatmeal powder and 1 tablespoon of honey. Mix well and apply the paste on the sunburn areas. Repeat the application once in day until the sunburn clears completely. Lavender essential oil has analgesic and anti-inflammatory properties that help to soothe the sunburn effectively. This oil possesses the tissue regeneration and has healing properties that relieve you from the sunburn discomforts very soon. Into bowl of water, add few drops of lavender essential oil. Mix well and soak a clean washcloth in it. Wring out the excess and spread it on the sunburn. Repeat the process daily to reduce the sunburn. Take some freshly extracted aloe vera gel and add few drops of lavender oil into it. Leave it on for few minutes or until it completely dries. You can either rinse off or leave it on. Follow this process regularly to complete relief from sunburn. Coconut oil contains lauric fatty acid that helps to promote the healing of the sunburn skin. It also prevents the discomfort caused from peeling and excessive dryness of the skin. You massage enough amounts of coconut oil on the sunburned skin for few minutes and let it dry completely. Alternatively, you can follow the below process. Take enough amounts of coconut oil in a bowl. Add few drops of lavender essential oil into it. Stir well and apply the mixture on the sunburn areas. Repeat the application regularly for effective results. Make sure to use cold compressed coconut oil for this purpose. You can just wipe off the excess oil with a tissue after massaging. But avoid washing off the application with water. Avoid applying coconut oil as soon as you get a sunburn as it can trap the heat inside and worsen the problem. You can try this process after a day. Milk is one of the safe, quick and cost effective remedy to treat sunburn. Milk forms a layer on the skin to soothe the discomfort and heal the sunburn. The coolness of it reduce the heat and prevents further damage. Take sufficient amounts of cool milk and soak a washcloth in it. Let it soak for few minutes and wring out the excess. Place the washcloth on the sunburn areas. Leave it on until it completely dries. Re-soak the washcloth and place it again on the affected area. Make sure the milk is still cold, if it is not then refrigerate it. Rinse the sunburned areas with cool water and pat dry. Continue doing this process daily until you get complete relief. Note: You can also use almond or coconut milk for this process. This DIY sunburn spray helps to heal sunburn quickly. All the ingredients used in this process contains anti-inflammatory properties. It provides quick relief from itching, swelling and skin peeling. Combine 2 tablespoons of water, 2 – 3 drops of lavender oil, 1 drop helichrysum oil and 1/2 teaspoon freshly extracted aloe vera gel. Shake the bottle well and spray the solution the sunburn areas. Leave it to dry naturally. Repeat the spraying 3 – 4 times in a day until the sunburn heals. The lycopene present in tomato possess antioxidant properties which help to provide cooling effected to the sunburned skin. The vitamin A and C present in it replenish the skin and protect it from UV rays. Blend 2 – 4 medium sized tomatoes. Stain the pulp to extract the juice. Combine tomato juice and 1 tablespoons of yogurt. Gently massage for a minute and leave it on for 15 – 25 minutes. Repeat the process 2 – 3 times in a day until you heal the sunburn. Lettuce contains anti-inflammatory and analgesic properties which cure the sunburn and the symptoms caused by it. This lettuce soothing decoction provides immediate relief from the pain. Take enough amounts of lettuce leaves depending on the sunburn area. Into a saucepan, add lettuce leaves and water into it. Let them boil for 15 – 20 minutes and turn off the heat. Strain the decoction and allow it to cool down. Once the solution cools down, apply it on the affected areas using a cotton ball. Repeat the process multiple times in a week to get relief from sunburn pain. Marshmallow is also considered as one of the best herbal remedy for treating sunburn. It has many components like mucilage, pectin and sucrose that form a protective layer to cure the inflammation and pain. Into a saucepan, add water 1 – 2 cups of water and marshmallow. Boil it for about 10 – 15 minutes on low flame. Strain the tea and allow it to get cool for few minutes. Now take a gauze and soak it in this solution. Apply this on the sunburned skin and let it dry naturally. For more effective results over sunburn, you have to apply this regularly. Honey is a natural antibiotic that helps to trap the moisture in the skin and treats the sunburn effectively. It has an enzyme that repairs the damaged skin. It has anti-inflammatory property that decreases the swelling and inflammation associated with the sunburn. Take sufficient amounts of honey and slather it on the sunburn areas. Allow it to get dry naturally for few minutes. Continue applying this regularly for 2 – 3 times daily for at least a week. For added benefits: Consume 1 tablespoon of honey followed by a glass of lukewarm water. Do this 3 times in a day to boost up your immune system and get quick relief from the sunburn. This homemade spray made with various herbs helps provide immediate relief from the discomforts cause by sunburn. Add 1 tablespoon each of dried mint leaf, lavender flowers and dried plantain leaf. Let it cool down completely and strain it. Pour it into a spray bottle and add equal amounts of apple cider vinegar. Close the lid and shake well to let the ingredients incorporate. Spray enough amounts of the solution on the affected areas and leave it to dry completely. This is one of the best Ayurvedic remedies to treat sunburn. Sandalwood contains amazing cooling properties while turmeric prevents the skin peeling and blisters. Mix equal amounts of sandalwood powder and turmeric powder. Add some water and mix them to make a paste. Have a cool shower bath while suffering from sunburn, it helps to reduce the trapped heat and speedup the healing process. Rubbing coriander oil on the affected areas also helps to reduce inflammation and other discomforts. Aloe vera contains lidocaine, an anesthetic that effectively gives relief from the sunburn pain. So, apply aloe vera containing lotions for the same. Usage of over the counter creams like 1% hydrocortisone cream will relieve you from sunburn pain, itch and swelling. Also OTC pain relievers like ibuprofen, naproxen will help to relieve from pain and inflammation caused by sunburn. Applying ozontated olive oil also helps to reduce the sunburn. Vitamin E which is an antioxidant helps to decrease the inflammation caused by sunburn. Apply vitamin E oil on the affected area of the skin or else take vitamin E supplement. Prevention is always better than cure. So always apply sunscreen whenever you go outside and also wear protective clothing to avoid direct exposure to the sun. Protect yourself from the prime hours of the day i.e. in between 11 am and 4 pm in which the sun is most powerful and damaging. So try to reduce your exposure to it or else wear hat or scarf to prevent its UV harm on your skin. Rub the watermelon rind on the affected area to calm the skin and tone down the blisters or redness. Strawberries or apricot pulp application can also be helpful for treating sunburn. Apply sunscreen with more SPF (SPF 15 to 30) 30 minutes before you step out in the sun. Never forget to apply this on the sensitive areas of the skin like ears, back of neck, shoulders, back of the legs and arms. Make sure to re-apply it once in 2 – 3 hours to prevent the sunburn (especially if you’re spending time in beach). Certain medications like antibiotics, pills, creams, antifungal medications will make you more sensitive to the sun. So it is better to check with your doctor. Avoid soaking your burned skin in soapy water or bubble bath as this will dry out and cause irritation to the affected skin. It’s better to soak it in a cool or tepid bath and then pat dry with a clean and soft towel. Sunburn will make the skin dehydrated so drink plenty of water to keep you hydrated and heal the damaged skin to get relief from the sunburn and its effect on the skin. Avoid applying petroleum jelly which may exacerbate the burned skin by blocking the pores. Also stop applying anything if the burn is blistering. Make sure to consult your doctor or dermatologist if you didn’t find relief from sunburn pain and discomfort within a week to 10 days after using these remedies. If you’re experiencing fever, chills, extensive blistering, intense itching, purple discoloration of the patches, nausea, faintness, etc. then consult a doctor for immediate help. Avoid direct sunlight on the skin until your sunburn heals completely or else it can lead to skin cancer. Always wear tight woven clothes which cover the whole body including your arms and legs. Also wear the clothes that are specially designed in providing sun protection by checking the label for its Ultraviolet Protection Factor (UPF) which blocks the damaging sunlight into the body. Wearing dark colored fabrics will give more protection against the harmful UV rays. Try any remedy without interruption for few days to get relief from sunburn. Share your experience of combating the problem in the comment section below. You can also write to us your queries and suggestions, we will respond to them as soon as possible.